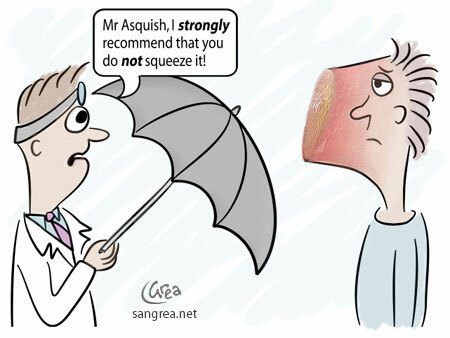 Last week I saw my Dermatologist as I have a lump growing on my right lower cheek which I was hoping would go away. Best case scenario was that it was a boil or a pimple that forgot I was nearly 50 and that would be that. Not to be, it is under a freckle that I have had all my life, so that was a little concerning and while it is noticeable as a pea sized lump on my face, it is very definitely also pea sized under my skin too. I knew I couldn’t ignore it for much longer! Funny, sad and true all at the same time really. Anyway, back to the lump. She analysed it thoroughly and mumbling “hmmm”, “ok”, “hmmm”. She stepped back to have a look, looked at it from the left and right and had her head in so many different directions I was expecting her to do a handstand to see it at a different angle altogether. Final analysis…..it’s got to go. She really doesn’t know what it is but she is suspicious of it. We are hoping and praying it is a benign odd cyst that my body has decided to grow but either way my philosophy is always better to know what we are dealing with than to sit and wonder. She is going to do a biopsy in 2 weeks time and then we will take things from there. So that’s the lumpy, bumpy thing but the other issue I’ve been battling for a number of months now is a drooping right eyelid. I have seen an Ophthalmologist and he at that stage thought I had a slight scratch in my cornea and my dry eyes ( Sicca Syndrome) was in overdrive so we decided to treat it with lots of artificial tears with instructions to come back and see him if it didn’t get better. Well, of course I broke a leg not long after that so it wasn’t a major priority. I have today made an appointment though as I had one of the worst episodes ever yesterday where the eyelid just closed over my right eye in some sort of spasm and I had no function in the muscle to open it for at least a minute. Doesn’t sound like a long time but when it happens it is really scary and very disconcerting. This is about the 4th time it has been that bad. Each day I get the sensation that its going to do that but it doesn’t eventuate or if it does it is in a minute way so I don’t notice as much. I also have started getting brief episodes of double vision with it so I am again hoping to find out what’s going on as soon as possible. < Previous Dental CT Scan Results ~ I haven’t escaped with a clear report card!! Next > Disabled Decor ~ A nice house is still possible with a bit of creative thinking!